Pretty well recon'd except scuzzy lacquer. Valves work well, easy playing, lots of volume. INCLUDES: a Reynolds 1st valve tuning widget , I recommend having it installed as these are cool and it'll fit. and a small tuba case which fits the body perfectly. Don't have a bell case, you can get a bass drum case if you need one. This is the big brother to the O-99. It is a .689" bore whereas the O-99 had the more common Olds bore of .656" through all four pistons. This shares identical porting and the slide mostly are the same layout. (I think 4th is routed differently.) They play very well. BUMP for an interesting tuba! not sure if it has anything to do with the Olds O-99 although the configuration is mirrored, or if it is just the Reynolds Contempora rebranded. Same exact size and config as Reynolds all the way around...pretty sure they were made side-by-side in Abeline with just different machining on details, in a Oldsmobile-Buick kind of way. hard to imagine it any other way. Interesting of 5th valve potential...but the open Eb falsetone is so good I don't think there's a need. How is the intonation with the custom bell? Are the custom bell's dimensions close enough to an OEM 20" bell that the intonation isn't affected? Good question, it does have a different look but it is very similar in dimension. It's within an inch of the OEM height, and an inch here affects pitch a lot less than an inch of leadpipe or tuning slide so there are no troubles on pitch. I do like to use 3 for bottom line G and the E natural below it can sag flat...not a big lip needed there, just needs to be played firmly. 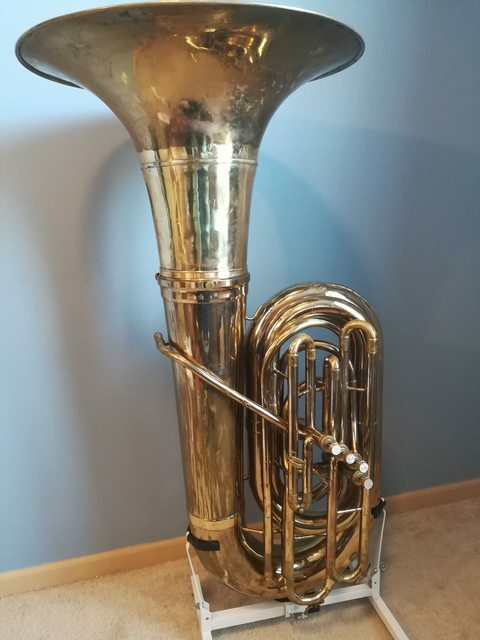 Pretty good pitch for a big tuba. Pretty sure the flare sections on Reynolds/Olds upright vs recording (maybe even sousaphone) are highly related and just have varying amounts of flange on the flare. Even the 20" has a little bit of a flange to it, so it's not really changing much bringing it out to 22.5".